Fear not, there’s no statute of limitations on zombie apocalypses. So here comes another one. And although the acting can be a bit mechanical, Syfy’s Z Nation may have enough pop, intrigue and indispensable gore to serve as more than a mere placeholder for AMC’s The Walking Dead, whose Season 5 is due on Oct. 12th. It might even have the chops to develop its own fairly large and devoted following during the course of a scheduled 13-episode first season. Friday’s premiere is frenetic from the start, with the U.S. president already dead and the country two years deep into zombie hell. Delta Force Lt. Mark Hammond (Harold Perrineau) and his remaining men are fighting off another furious zombie attack while a nerdy dude who’s dubbed himself “Citizen Z” (DJ Qualls) is issuing orders from his Northern Light lair. It’s essential to keep experimenting on convict guinea pigs in hopes of finding a vaccine. And if anyone passes the all-important zombie immunity test, he must be transported to the sole remaining viral lab atop California’s Mount Wilson. Sure enough, we may have a winner. Then it’s suddenly a year later, with a group of survivors prayerfully sending off a 64-year-old bed-ridden woman who’s more than ready to be granted “mercy” from those still able to fend for themselves. Murphy’s torso bears the ugly scars of gorging zombies, who converged on him during experimentation but couldn’t end his life. Now he could be the meal ticket for the entire human race. But a treacherous cross-country trek from New York to California separates the survivors from Mount Wilson. And if Citizen Z clicks with viewers, it’s likely to take a long time to get there. No wonder. 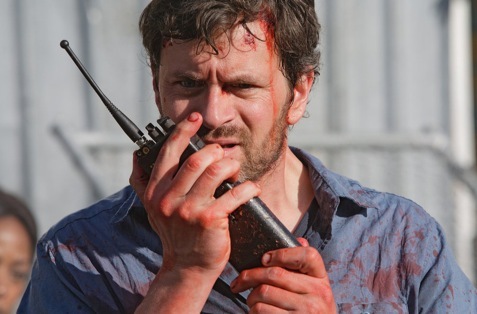 The zombies of Z Nation are far swifter afoot than the plodding, stagger-stepping flesh-eaters of The Walking Dead. They’re also adept at playing possum. But as in Walking Dead, a well-placed kill shot to the head re-ends their lives. The violence here is every bit as gruesome, and certainly as frequent in the first hour at least. Director John Hyams (the Universal Soldier movies) is not one to dawdle. He infuses the premiere episode with constant jeopardy, sometimes leaving the acting for dead, too. In Episode 1, it generally ranges from stilted to adequate. Perrineau, who was a second banana in Lost, is affixed with a jagged scar that bisects the left side of his face from nostril to ear lobe. He gets top billing in Z Nation, but doesn’t have a leading man’s screen presence. By episode’s end, though, his character’s participation may no longer be needed after a jolting turn of events. On the other hand, might it somehow not be as bad for him as it looks? However it fares, Z Nation opens at a sprinter’s speed and for the most part keeps up that pace. The blood flow is constant and the makeup department answers the bell. Some full-blooded characters will be essential, though. Even the most hard-core zombie fan might want at least a little flesh on the bone.